A man who was arrested in London earlier this week had nothing to do with Russian music site Allofmp3.com . That's according to a statement released by the less-than-legal website yesterday. "The Allofmp3 store has never had any activities outside Russia. Thus we do not have any offices or employees abroad. Allofmp3 operates in full compliance with Russian legislation and pays the necessary royalties to the rightholders and authors," the statement said. "The members of the IFPI (International Federation of the Phonographic Industry) are unable to do anything about the natural crisis the music industry faces in the digital era. Instead they engage in unfair competition practices and political lobbying. They make up 'sensational' news to attract public attention to their activity which becomes less and less valid every day," it continued. Earlier in the year, credit card companies including MasterCard , Visa and also PayPal blocked all payments to the site. Allofmp3.com charges tiny amounts to download entire albums, and gives no money back to the music industry. It was thought that the arrested man, 25, was the UK agent of Allofmp3.com, helping the site circumvent the credit card ban by selling vouchers on Ebay among other sites. He was allegedly charging £10 per voucher and feeding the money back into offshore bank accounts belonging to Allofmp3's Russian owners. 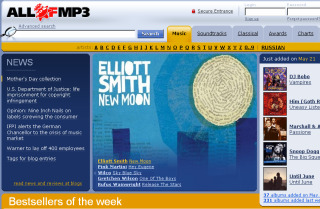 Allofmp3 has long been an annoyance to the music industry, offering high quality MP3s for just 6p per track. This compares with the 79p that rivals such as iTunes typically charge. Brand new albums can be obtained for as little as £1.30, compared with the £10 typically charged by legal retailers. The site is able to charge so little because it pays no royalties to any of the record labels that own the recordings, meaning it can make a profit on albums no matter how much it charges. In doing so, it's breaking just about every single copyright law in existence.